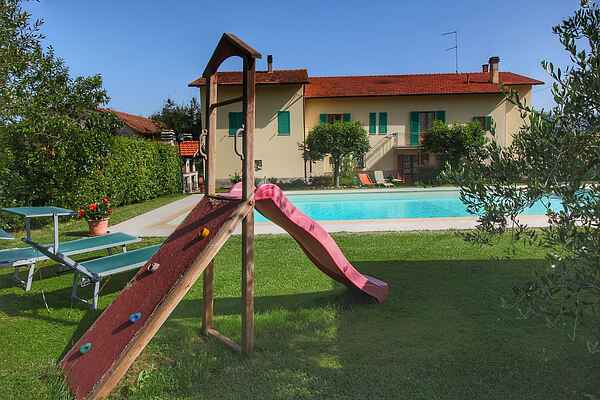 Apartment Montecchio is a beautiful apartment in an agriturismo. It is located in the valley of Roccavo dominated by the old castle of Montecchio. The agriturismo is located in an oasis of peace between olive trees, vineyards and fields. The agriturismo produces organic white and red wine, extra virgin olive oil and vegetables. On request there is an olive and wine tasting organized and typical Tuscan meals are available on request. Montecchio apartment is completely renovated and situated on the top floor of the house. The decor is modern and functional. Around the house is a spacious garden and a swimming pool. On the terrace you can enjoy a glass of local wine or read a book.